Welcome back to the arcane world of athletic foodstuffs. Like the boxers and weightlifters before them, these international sausage competitors live in two different worlds. In one, they are dedicated to the continual improvement of their physical forms, seeing in themselves the promise of potential realized. In the other—the one with which we are more familiar—they are dedicated to their own consumption. And there, atop the grills, the two worlds join, becoming one warped world in which nothing will ever make sense again. 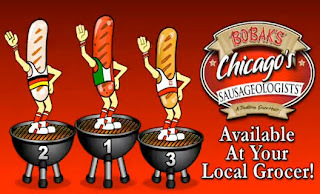 Italian Sausage made it to the top of the podium, German Sausage silvered, and Polish Sausage came in third. But you know what? For making it to the finish line and down into some guy's stomach, they're all winners! Addendum: Feeling as though you've seen something similar? Perhaps you have.